Prior to the trip, I repackaged a few ingredients to save space and ounces. The nori sheets went into a ziplock bag. 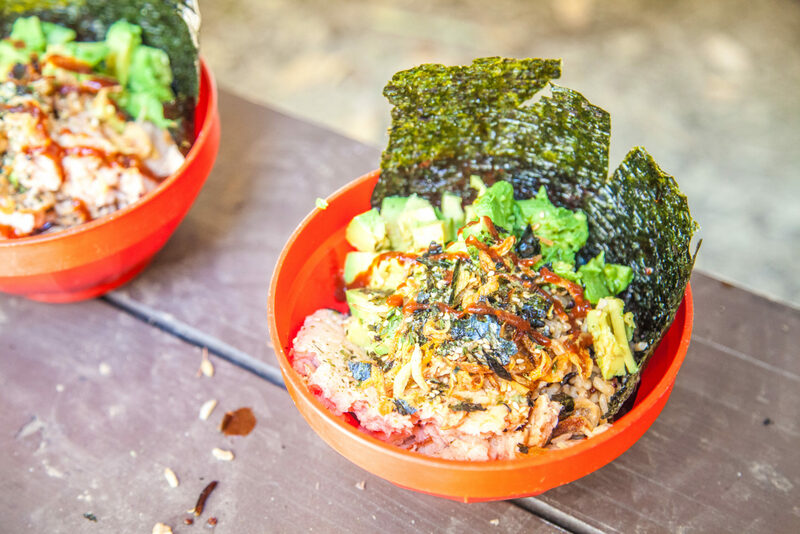 With it, the furikake. I could have also added the shallots in, but since those were also being used with the spring rolls on this trip, I kept them separate. Microwave-packet rice and quinoa is heated up with a little bit of water.They are the perfect size for 1-2 people; one if you’re really hungry, two if you only want a snack. For this trip, I used two packets for three people. Don’t worry if you accidentally add too much water; you can always boil it out. A small dash of vinegar and sugar can be added to make it similar to sushi rice. I haven’t been able to get the ratios perfected, but it’s an option if you’ve got time to fiddle around. While the rice is cooking, prep the rest of your ingredients. Place seaweed into your bowl. 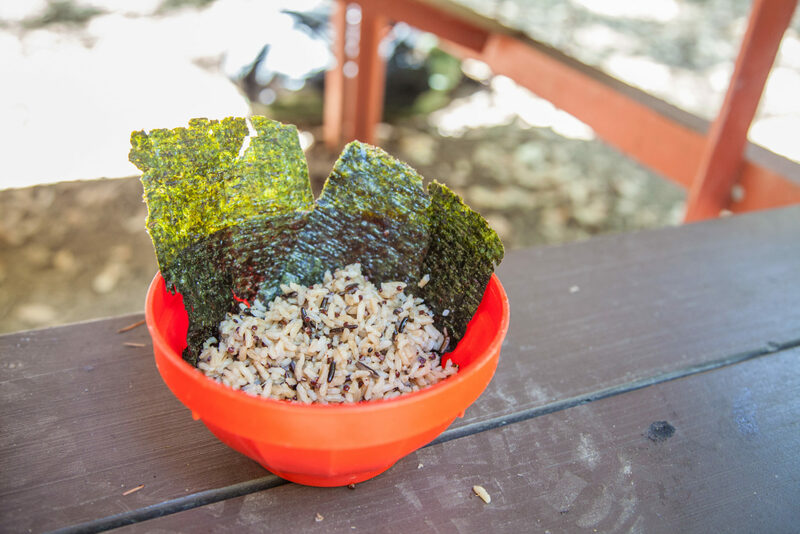 Once you add the warm rice to the bowl, the seaweed will soften, and you can toss all the ingredients on top. Add avocado. Salmon goes on top. For this go-around, I used the Chicken of the Sea salmon packets. You could also get fancy and use smoked salmon. Sprinkle with furikake and fried shallots. 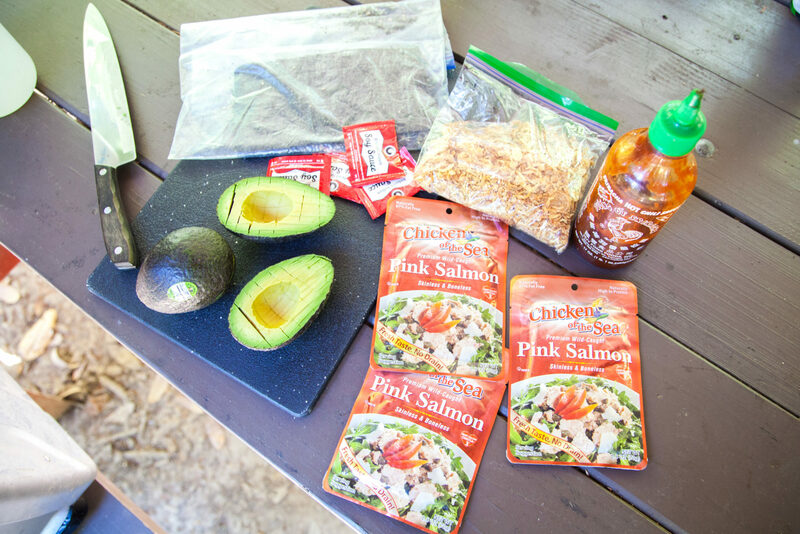 Toss on a dash of soy sauce–for backpacking, I swipe the little packets from Whole Foods’ pre-packaged sushi section. Drizzle sriracha if you’d like. Open the packet of quinoa and brown rice and toss into a skillet. 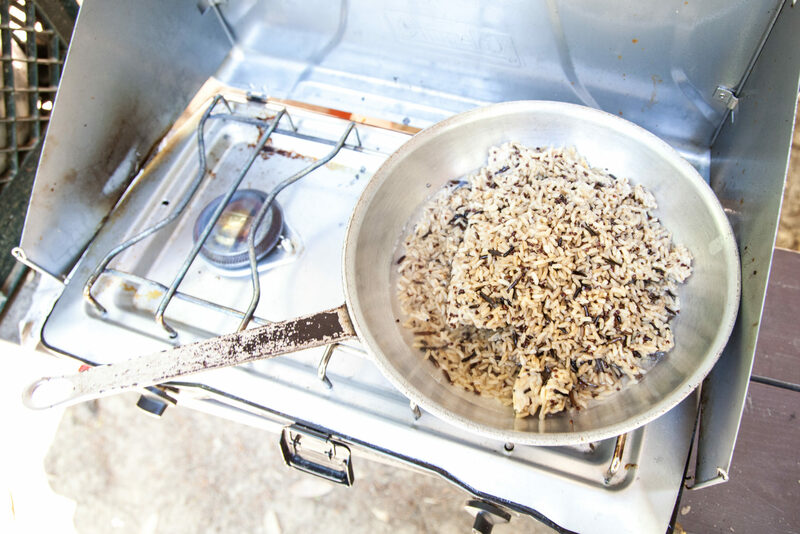 Add 2-3 tablespoons of water, enough to heat up and finish cooking the quinoa-rice. Don’t worry if you add too much, you can always boil out the extra. While the rice is cooking, pit and slice the avocado for serving. Place sheets of nori into the bowl. When the rice is done cooking, divide into the bowls. Add as much avocado if you’d like. Toss on one packet of salmon. Sprinkle with furikake and fried shallots, as much as you’d like. Empty a packet of soy sauce on top. Drizzle with sriracha, if that’s your thing.